"The lemniscate is, fundamentally a mechanism for the infinite. A lemniscus or 'ribbon' that chases itself in a figure of eight describes the repeated and unending journey of the unbounded. Jorinde Voigt draws structures energized by real and imagined possibilities to investigate finite boundaries of systems. She frames and moderates these investigations with spatiotemporal data, information on speed, volume, and an overlaying of sequences. Her notations embrace the concept that elements of equal value co-exist in a logic and proportion of their own. 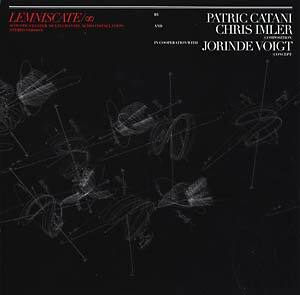 In 2008, following Voigt's concepts, composers Patric Catani and Chris Imler, developed the 'lazy 8' of the infinity motif at Watermill-Center, NYC, a laboratory for performance, in the form of an acoustic 'cluster.' The looped composition formed of 16 chapters, snakes around 7 points realized using a multi-channel arrangement of 6 loudspeakers and thus describes the shape of a lemniscate through pure sound. To enable home listening, the multi-channel installation has been mixed down by the artists as a stereo version. LP in a limited edition of 260 copies."